4 star, AA Superior rated Hotel, Spa, Conference Center, Day Visitor & Tour Destination with Function & Event facilities linked to a 2 star AA Recommended block of self catering apartments also available on a timeshare basis FULLY sold out with , these days, hotel only acting as managing & letting agent for which it collects a “handsome” managing agents fee and commission. 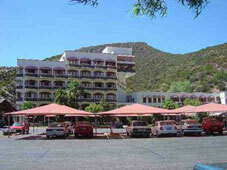 Timeshare Body Corporate VERY solid with VERY healthy reserves and financially totally self sufficient. Turnover: Roughly R7,05 M per annum (2002 /3) escalating at 10 – 15% with an average GP of 72%. First built in 1985 with sections added on in ’86 & ’87. Brick and reinforced concrete structure ranging from ground floor to 6 floors at it’s highest point with high quality finishes, fixtures and fittings throughout. The ENTIRE interior was fully refurbished at a cost of ZAR 2.5 M in 1996 with roughly R500 000 pa spent on ongoing improvements since then. Total available land – 27 000 sqm with HUGE expansion possibilities. 2 restaurants seating 150 & 36 respectively, each with own kitchen. 1 indoor pool linked to full health spa and gym with steam bath and treatment rooms. Games room and 3 shops/boutiques. Lift and ramps to all levels including wheelchair ramp into main hot spring pool – i.e. physically challenged friendly. Conference room for up to 120 people. 24 hour reception area & security. Tarred car park with parking for 200 vehicles including 47 under cover bays. Function and catering area with space for up to 250 pax fully equipped with buffet counters etc. Room service, café and take away division with own kitchen. Large gardens with day visitor and picnic facilities. 18 hole mini golf course. Bird sanctuary, aviary and nature conservation area borders on Hotel property. By arrangement with neighbouring holiday home park, free access to tennis courts and half an Olympic size cold water pool, as well as play park for children. Rental access to another 120 chalets with a bed capacity of almost 500 people. As already indicated, the 43*C Hot thermal and radio active springs are the property of the Hotel. The opportunity to OWN this spring is pretty unique in South Africa and even rarer in other countries where natural wonders such as these are normally state controlled or belong to the public at large. With the amount of land that is available the possibility of further expansion and the development of more accommodation, health facilities (Kur Ort) and other features such as a water park, are almost endless and with the level of demand that the hotel is (and has been) experiencing these past years, there is no question that this extra demand already exists and is only waiting to be exploited viz. 6 x Family Garden Suites to be built by end 2003 adding 36 beds. of the Cape and is rightfully known as the jewel in the crown of the Western Cape. A new road completed in 2001 makes it an easy drive from Cape Town and it’s natural beauty, climate and location is proving an irresistible draw card for visitors from all over the world. In a nutshell, the town is fast becoming the Cape’s true resort town and is particularly popular in the winter months. Of recent it is also starting to attract international attention as one of the best locations in the world for the extreme sport known as “rock climbing’ and in May 2003, the hotel hosted a weekend event that attracted over 1000 participants and spectators to this and other extreme sports. The next event is scheduled for May 2004. 4 X 4 Adventure Routes, walks and hikes with overnight huts in the mountains, Game farms with hunting facilities, Sporting activities such as bowels & squash whilst the town is rich in culture and historical value.